The player roster allow the same option without the season mode complete with depth chart and free agent pools that include Corey Dillon and Mike Vanderjagt. Haven’t found a situation yet where you can’t switch first picks with other teams in the top 5 or 6 picks. If you need help, go to http://www.madden08.com for a roster update list (NOTE: no longer supported). If cap penalties and other logistics go beyond your realm, then rely on the CPU can always make up any roster issues and discrepancies, which really promotes a lot of experimentation. After you update the rosters, you can simulate the entire season to see who the big contenders might be (It was the Chiefs, Colts, Broncos, Patriots, Chargers, Bengals, Saints, Giants, Redskins, Bears, Rams and Eagles with no updates). You can even choose a “total control simulation” where you call the plays, possibly ensuring your big players can pad their stats. You have to simulate each individual game in week 17, then division and conference playoffs (surprisingly low scoring fares). You even get an AFC/NFC pro bowl, which you can also spawn, right before the off season. This game is rated E some of the music lyrics in the soundtrack songs are questionable, so parents beware! 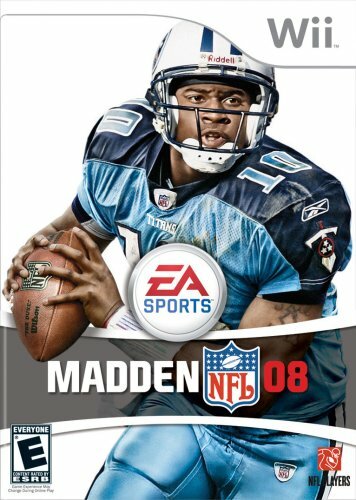 The recommended (*** out of four stars) Madden 08 goes to another level as armchair quarterbacks, families and diehard players alike can all get in this game. Also available on GameCube, Nintendo DS, PC, PS2, PS3, PSP, Xbox and Xbox 360. Rated E for everyone. This entry was posted in Video Game Reviews and tagged Madden NFL 08, Michael Siebenaler, Mike Siebenaler, Nintendo, Nintendo Wii, Tall Writer, video games, Wii. Bookmark the permalink.